TAOISEACH LEO VARADKAR said he steered away from a carbon tax in this year’s Budget, but acknowledged the government will have to bite the bullet on it. 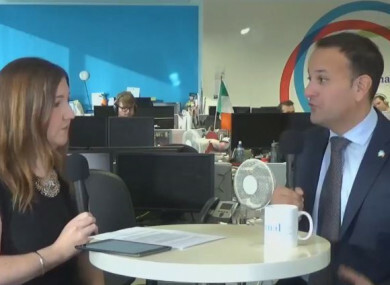 Speaking to TheJournal.ie this morning, the Taoiseach explained why a carbon tax did not appear, despite stating during the summer he intended to introduce one. He said the question he had to ask was “is it the appropriate time” to introduce a carbon tax “heading into winter” and into Brexit when prices are going up already. The Taoiseach said such a move would “hit people with a double whammy” and would have “totally wiped out” any benefits people had got in the Budget through tax cuts. The Budget has been dubbed an election budget – something the Taoiseach awkwardly laughed off today. However, when pointed out to Varadkar that some might see it as a political move not to increase the cost of fuel for people heading into winter, he said he took the decision not to increase it as there “has already been a big increase in the price” of petrol, diesel, electricity and gas in recent months. He added that he was part of the government that introduced the tax in the first place. Ultimately, government sources said it came down to a choice between the VAT rate and carbon tax. The Taoiseach said the reversal of the VAT rate will bring in €600 million – adding that he would have to introduce a very high carbon tax rate to bring in such monies. Varadkar said he wanted to wait until there was “party consensus” to increase the tax from now until 2030, adding that it other countries it has become a “very political” issue. The Taoiseach also defended the measure of 100% mortgage relief for landlords, stating he introduced it in a bid to stop landlords from selling their properties. “Renters are struggling to pay the rent, I get that, but there are also people struggling to pay their mortgage, to pay childcare, some people are living at home with their parents to save for a deposit,” he said. When landlords sell, tenants are evicted, he said, adding that the tax incentive will cost €11 million. He said a balance between tenant and landlord rights will be balanced when the Residential Tenancy Board have the additional powers and resources to enforce rent caps. “People always say there isn’t enough in the Budget on Housing, I feel like, in many ways we are throwing the kitchen sink at it. We need to be building 35,000 new homes in Ireland every year, Varadkar said. Other issues touched on by the Taoiseach included the USC and how it is here to stay. The Taoiseach ruled out any introduction of a City Tax on larger hotels, stating that would be a matter for local authorities, and would not be national policy. He also explained why TDs were due a €1,000 pay hike this month, stating that ministers, the Tánaiste and the Taoiseach do not take it. Varadkar also addressed the issues surrounding the Naughten / McCourt meeting, but those events have since spiralled today, resulting in the loss of one minister and maybe another. You can watch the full interview with the Taoiseach here. Email “'I'm not afraid to take tough decisions: Leo says carbon tax would have been a 'double whammy'”. Feedback on “'I'm not afraid to take tough decisions: Leo says carbon tax would have been a 'double whammy'”.